Here at Tampo Print Canada, we stock over one thousand different printing pad shapes and sizes, with something to suit all applications. All of our printing pads are made from high quality materials and are designed for industrial pad printing. Our printing pads are available in two types; our standard and antistatic pads. Here we’ll explain the properties of each pad type and their benefits to help you decide on the best ones to suit your printing project. Our standard printing pads are made from high quality silicone and are designed for long-run print jobs with minimal changeovers. 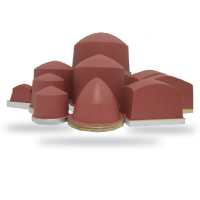 They are one of our most popular pad types and are available in a wide range of shapes and hardness. We also give our customers the opportunity to purchase custom made standard pads, which can be tailored to any shape, size and volume. Our standard pads, which are red in colour, are extremely durable, yet also flexible during performance. They are suitable for carrying out a wide range of pad printing applications and benefit from being extremely resistant to tears and abrasion. Out of all of the pads we stock, we believe that our standard silicone pads offer the best quality printing in the long run. So if you are after quality pads that are capable of achieving an excellent print finish, our standard pads will make a great choice. We offer them at competitive prices, allowing businesses of all sizes the opportunity to use them. For those who require a quick start to pad printing or are printing onto high static materials such as ABS, Polystyrene and Acrylic, we highly recommend using our antistatic pads. We have also found them to be particularly great in dry condition environments, making them ideal for using throughout the winter months here in Canada and the United States. Although our standard printing pads have always been very popular with customers, more recently we have seen an increase in demand for our antistatic printing pads. After speaking to a few customers, we found that many people were ordering these pads due to their antistatic, high tear strength and long life. Aside from being highly robust and great for using with static materials, our antistatic pads are also ideal for using with UV inks. 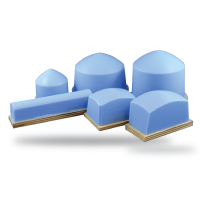 If you plan on doing any printing with UV ink or simply require pads that offer excellent ink absorption then our antistatic pads may be the best choice for you. When it comes to choosing your pads for a printing job, you need to consider the image size you are looking to print, as well as the shape and strength of the product you are printing it on to. Where possible, we recommend that customers choose the most pointed pad that is practical for their application as it will reduce air inclusion during the ink pick-up and transfer process. We also suggest that you go for the max hardness that your item can handle, as it will pick up more ink and detail from your plate, allowing for a better quality finish. Make sure that you choose a pad that is large enough for your image and product. Larger pads will reduce distortion of the printed image, particularly on uneven and curved surfaces. It’s hard to say which is best between standard pads and antistatic pads because it all depends on the application. If you are printing onto high static materials or need a pad that doesn’t have a long activation period, then antistatic pads are your best bet. For all other everyday printing jobs, standard printing pads are a great choice for quality and customization. If you need any help deciding on the best pads for your printing application, feel free to get in touch.